We just finished learning about reptiles and have started our discussion about birds. Only having one hour a week to teach science to my kiddos, I try to read a story, do an activity or experiment, and finish off with a short craft, game, song, or writing activity in our science journals. Just a quick peek of a few things we have done with our animal unit in first grade this last week. 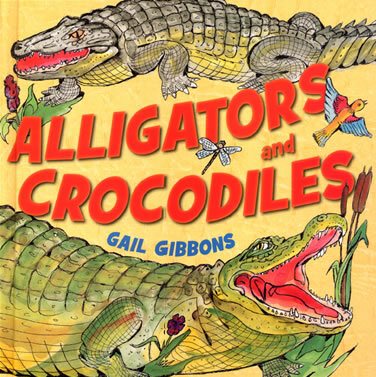 We made quick little gators after reading Gail Gibbons story Alligators and Crocodiles and doing our 5 little monkeys song. The kids love doing songs or chants. We started our day with asking what they knew so far about birds. We made a huge list because their teachers have been front loading! Yea! We also made a list of birds that they knew. We know a lot of different birds. We drew our favorite in our science notebook and listed 3 things that made it a bird. Here is our class chart. We worked with bird songs in the background! I love the loon calls, it reminds me of summer at the lake! Oh, I miss warm weather! We finished our time with a story and review today.